Researchers identify ‘cleaner’ protein which protects against atherosclerosis in P-O-C.
Atherosclerosis is largely caused by oxidised blood fats. The research findings presented in a new study by researchers from the Lund University show that A1M stops the oxidation of blood fats and keeps them in good condition. Not only that, A1M can also repair oxidised blood fats. The protein A1M, alpha-1-microglobulin, exists in the body to clear out oxidised heme and other harmful molecules. Heme contains iron and is found in haemoglobin, which has the job of transporting oxygen around the body. When the oxygen is metabolised, harmful molecules known as free radicals are formed. The heme-molecule can also generate free radicals and release the toxic iron into our tissue, cells and DNA. The body has many methods of keeping both heme and free radicals in check. The opensource study is published in the Frontiers in Physiology. Ten years ago the team demonstrated that A1M has the ability to bind the free radicals and the toxic heme molecules and convert them into harmless substances. The team stated in previous studies that the tissue is rinsed by A1M in a 5-10 minute cycle, with the protein absorbing the free radicals and heme-groups. A1M acts like a bin that captures and neutralises toxic substances throughout the body, in and around all cells, that would otherwise cause inflammation and damage to surrounding tissue. In the current study the team focused on two of the main causes of atherosclerosis, oxidation of LDL (commonly called ‘bad cholesterol’) and myeloperoxidase (MPO). MPO is a molecule in the white blood cells that is activated in inflammation and infection and, like haemoglobin, contains toxic heme substances. By studying and testing A1M’s properties in relation to LDL and MPO the researchers discovered that A1M can clean and reduce oxidised blood fats from LDL, as well as taking care of the dangerous substances from MPO and breaking them down. This means that A1M protects against damage to the molecules that researchers know is a cause of atherosclerosis. The team state that the findings were obtained through lab research carried out in test tubes, so the next step are animal experiments, as well as analysis of human tissues. The researchers also plan to study the blood to see if there is a link between the level of A1M, the concentration of oxidised blood fats and the development of atherosclerosis. The team summise that if this correlation exists it will be possible in the future to develop a preventive drug that reduces the risk of atherosclerosis. It’s not impossible that future patients could receive one dose of A1M per month to clean the blood vessels. Tentative function of A1M in protection against bystander oxidative damage caused by neutrophils. The figure summarizes the findings of this paper in a physiological context. 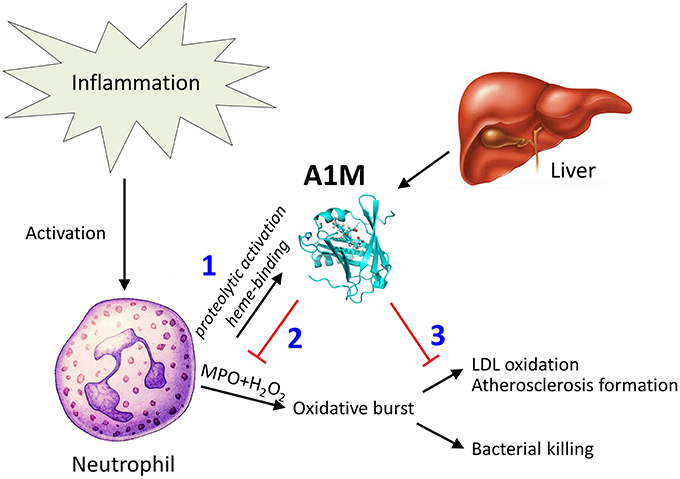 Recruitment and activation of neutrophils during inflammation involves MPO-mediated bacterial killing but may also yield LDL-oxidation as a side-effect. (1) Neutrophil culture medium or purified MPO induces heme-binding of A1M, and proteolytic cleavage of the protein which was previously shown to activate a heme-degradation activity of A1M (Allhorn et al., 2002). (2) The induced heme-degradation mechanism of A1M is tentatively “disarming” the peroxidase, preventing oxidative burst. (3) LDL-oxidation by MPO is inhibited by A1M, and pre-formed oxidation products on LDL are reduced. A1M/α1-microglobulin is proteolytically activated by myeloperoxidase, binds its heme group and inhibits low density lipoprotein oxidation. Åkerström et al 2015.